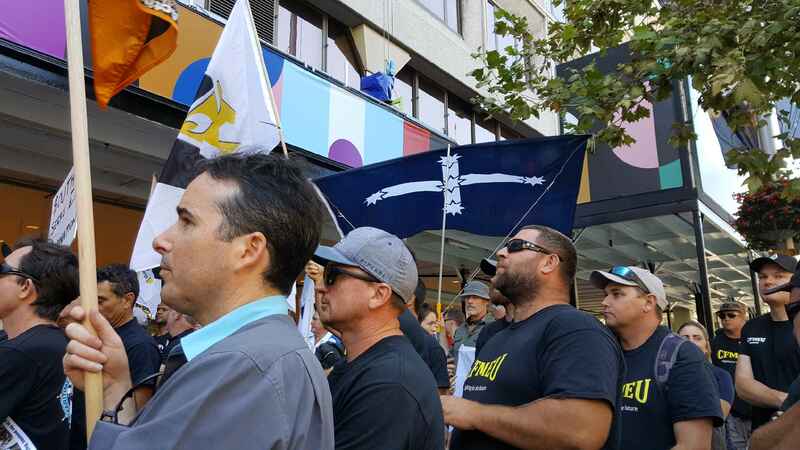 Sixty Port Kembla Coal Terminal workers are fighting for their jobs against a conspiracy involving three of the world’s biggest mining companies. After daring to take action to get a new enterprise agreement before Christmas, PKCT workers have twice been locked out. Outside a Commission hearing in Sydney on Thursday March 1, 200 protesters let the commissioners and corporations know that autumn’s arrival would not take the heat out of PKCT workers’ struggle. 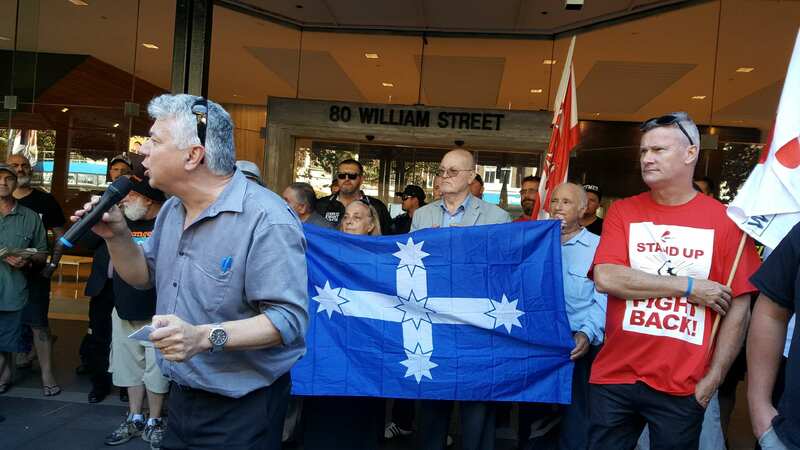 Each speaker emphasised that the company was following a premeditated strategy to get rid of unions in Australia’s most highly unionised region. An exposure by James Thomas and Alex McDonald called “Leaked documents reveal plan to replace workers at Port Kembla Coal Terminal”, first aired on the ABC’s 7.30. The plan included sacking 30 per cent of the workforce. Mr John Gorman is PCKT operations manager. His biggest gripe is that the organised workers have won a degree of self-management. This stops the bosses practising favouritism (or its opposite!) with bonuses, or by manipulating when and how long individual shifts are. Thomas and McDonald reveal, “In a separate memo by Mr Gorman in December 2016, he wrote that terminating the workers' agreement would give the company a ‘clean slate’ and ‘deliver outcomes that are more acceptable to the company’ and place workers on the ‘significantly less generous’ award. The article quoted Bradon Ellem, a professor of employment relations at the University of Sydney. "Documents reveal very clearly that there's a major chasm between the company's public pronouncements and their actual strategy,” he said. The article continued, “Professor Ellem believes the documents read as a playbook to break the grip of unions. "They clearly have an overall strategic plan which … is about in effect de-unionising the operation," Professor Ellem said. South Coast Labor Council Secretary Arthur Rorris calls PKCT “a multinational cabal”. Along with South32, it’s owned by giants Peabody Energy and Glencore, and two smaller multinationals, Centennial Coal and Wollongong Coal. Vanguard’s readers would be familiar with Glencore’s poisoning of the McArthur River near Borroloola in the NT. The Sydney Morning Herald’s Michael West has exposed labyrinthine methods used by Swiss-registered Glencore, formally called Xstrata, to pay almost no tax on $15bn income in recent years. US multinational Peabody is the largest private sector coal company in the world. Bankrupted in 2016, but up and running again, it has a long history of Australian operations, often in concert with Australian based corporations, like construction company Thiess Holdings, now part of Cimic, a Business Council member. Since 2010 Centennial Coal has been a wholly owned subsidiary of Thai-based Banpu Public Company. Centennial Coal has been hit with over 900 pollution notices from the NSW Environmental Protection Authority between 2000 and 2013, and has major environmental incidents since then. Jindal Steel and Power Ltd, an Indian corporation operating on three continents, is both majority owner of Wollongong Coal and majority recipient of its product. CFMEU Mining Division’s Tony Marr asked the crowd to be quiet and listen, to “the sound of lies being told upstairs”. He said corporations are “swimming in dough,” with coal prices doubling in the last year. ACTU President Sally McManus ridiculed the cabal’s whinges about wages. “Multinational companies are making plenty of money, plenty!” she said. Arthur Rorris slammed this message home, saying the Glencore CEO’s pay packet alone “is worth more than the entire wages bill for Port Kembla Coal Terminal”. The day after the protest, Guardian Australia’s Gareth Hutchens and Greg Jericho incidentally exposed the corporate wage theft that mirrors de-unionisation of Australia. It echoes 35 years of articles by Vanguard and others, pointing the finger at Hawke and Keating’s corporate-union Accord, as launching the downward slide. 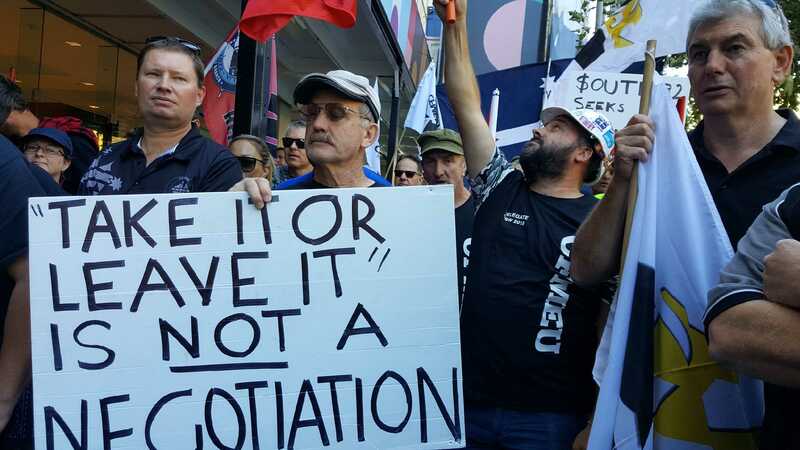 Enterprise bargaining – just one aspect of the Accord - stopped the flow on of wins in strategically powerful workplaces to less organised lower paid workers. Hutchens and Jericho emphasise the resulting gap between the better paid and lower paid workers. It’s exactly the outcome corporations intended. Some PKCT workers may earn up to $130,000 but it’s not their base wage. The company’s PR message is delivered by managers like Gorman in high vis gear. They hide the long shifts, overtime and hard-won concessions to drive wedges between the PKCT workers and more poorly paid workers. Hutchens and Jericho don’t touch on other well-planned corporate attacks to break worker unity and ability to fight in the 1980s. Contrary to statements by current ALP leadership hopefuls, it was no accident. The ALP, despite its remnants of working class support and good people in its ranks, has always been a part of capitalism. The 1980s lovefest between Hawke and big business, including corporate criminal Alan Bond, was just an outlandish manifestation of it. Individual contracts at Robe River mine in WA, the smashing of the Builders Labourers Federation, breaking the Pilots’ strike with overseas scabs, closing Cockatoo Island Dockyard and forced mergers of small militant unions – all this and more happened with ALP government management and complicity by some union leaders. The Building Workers Industrial Union, with so-called communist leadership, helped crush the BLF. Every speaker at the protest called to ‘Change the Rules’ that are so openly skewed towards corporations. Workers need some space to fight. Arthur Rorris’s final threat to escalate the dispute is not an empty one. In preparation, Garry Keane, Secretary of the Southern Region Maritime Union has helped re-form the Ports Committee of Unions, including public and private transport unions, the CFMEU, MUA and steelworkers. But there’s an even bigger picture. Capitalism is corrupt and anti-worker at its core. We need to change the system too. Capitalism has to go! Australia needs a system that serves the people not corporations. Building a communist party dedicated to this task has never been more urgent.